Much ado has been made over the famous 10-step Korean skin care routine. But let’s be honest: not all of us have time to double cleanse, use a toner and a serum, and apply a separate SPF on top of our moisturizer. The reality is, life gets busier by the day, and some of us want our flawless skin, like now! 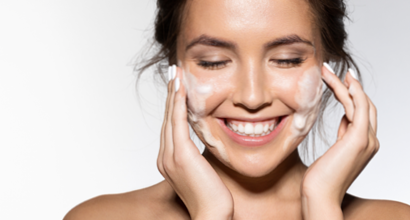 That’s why primers that double as moisturizers and cleansers that also tone are on the rise, without sacrificing a single ounce of quality or results. Below, we’ve picked out a handful of multi-tasking favourites—classic and cutting edge—that will help save precious minutes off your morning routine. This cult-classic, award-winning cleanser tones as it washes away makeup and excess oils. Instead of that tight feeling you sometimes get after cleansing, skin is left hydrated and conditioned, so you don’t need the re-balancing step of a separate toner. And don’t worry—zero residue is left behind. Fans of the O.G. Photo Finish Primer have been loving this time-saver that provides the same pore-blurring, long-lasting makeup benefits, along with 24-hour hydration. The primer-moisturizer hybrid contains legit skin care ingredients, like hyaluronic acid, which helps maintain moisture in the skin. Plus, niacinamide improves the look of enlarged pores, dullness and spotty tone, strengthening the skin barrier over time. Just as the name suggests, this Australian-born two-fer (formerly known as “Polish”—it’s got a beautiful new package) exfoliates dead skin cells with jojoba beads as you bask in the detoxifying Kaolin Clay mask. The result? A clean-as-a-whistle complexion that feels balanced and refreshed thanks to the anti-inflammatory, antibacterial effect of peppermint oil. Use twice a week for best results. A relative newcomer, this daily cleanser, exfoliator and mask can be used in pea-sized amount for a quick wash up, massaged in for a more intense scrub, or left on for five minutes as a bi-weekly treatment. The triple threat’s aromatic formula draws on French volcanic lava to remove impurities, along with soothing calendula and refreshing cucumber, leaving pores more refined and skin visibly radiant. We’ve all heard of tinted moisturizers, but can your tint colour correct as well? In this universal shade, green pigment balances out redness, red pigments offset dark discolouration, and light-reflecting gold pigments bring a healthy luster to mature skin. But that’s not all. This new addition to the all-natural brand contains medicinal plant extracts of soothing red clover, nourishing avocado and olive plant oils to leave the feel of your skin silky smooth.